Chylowen is a tastefully decorated and spacious family friendly holiday home, an easy five to ten minute walk from the centre of the historical village of Tintagel renowned for King Arthurs Castle. 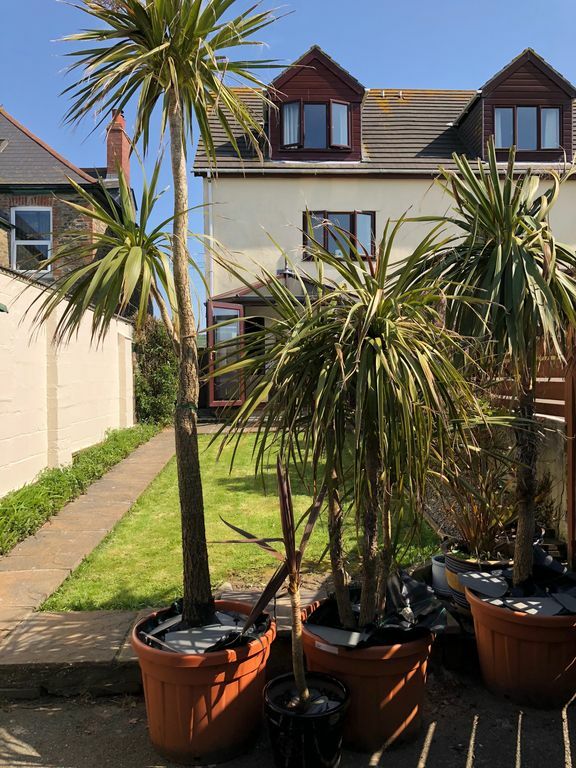 The property is set over three floors and is surrounded by stunning sea, coastal and countryside views with off road parking for two vehicles and storage for bikes or surfboards . The property comfortably sleeps 5/6 people plus a travel cot with a family bathroom and an ensuite master bedroom giving stunning views along the coast. There are two spectacular sandy beaches nearby at Trebarwith Strand and Bossiney, both now famous for surfing, and plenty more on the north coast all within driving distance. You can explore further afield with Boscastle, Port Isaac, Newquay, Bude and the famous Eden Project an easy drive away. The coast path is just a five minute walk from the house. Owned, cleaned and maintained by ourselves, a local family with many years of experience providing quality holiday accommodation, who live just a few doors away from Chylowen and are always on hand. I have lived in Tintagel all of my life. My husband and I feel very fortunate to live in what we consider to be the most beautiful part of the country. I worked for the local District and Parish Council until recently and at the Tintagel Visitor Centre, and my husband runs our own engineering business. Chylowen provides a high standard of accommodation and receives great feedback from our many visitors. We have provided the standard of accommodation that we expect to find when we holiday ourselves and consider that everything you need will be found at the property. The property is set just outside of the village of Tintagel, only a 5-10 minute walk from the centre of the village with all its amenities. Beautiful coastal walks can be taken from the property with the coast path only 5 minutes away. There are also beaches, varied attractions and quaint Cornish villages to be explored. Ensuite bathroom to master bedroom, fully tiled with shower, wash basin and WC. Large family bathroom situated on first floor with bath, with shower over, wash basin and wc. Storage heaters in all rooms. Electric fire in dining room and lounge. Two small additional fan heaters if required. The Bowood Park Golf Club, just six miles away, has a course which meets USGA standards and is open all year round. Golf clubs and buggies are available for hire on site. Notes on accommodation: Wi-Fi Sorry no pets are permitted at the property. No smoking indoors allowed. Outside: Rear enclosed garden with picnic table, small barbecue and rotary washing line. A small shed for limited storage and use of a spacious garage for bikes and surfboards. Cleaning / Towels / Linen : All linen and towels are included. The property is cleaned and maintained by the owners. Clean linen and towels can be provided for stays over 7 days. Other: Bright and airy modern conservatory which catches the afternoon and evening sun. A lovely room overlooking the garden to relax in after a day on the beach, surfing, walking or exploring the local area. We had a lovely comfortable stay in this property and could thoroughly recommend it for a great relaxing break. We stayed here in November and found the property warm and welcoming and had everything we needed. This property was well situated for us to explore and enjoy many places in this part of Cornwall. Great thought had gone into the comfort of our stay by the owners who provided us with a wide selection of literature of places to visit and things going on in the area. Thank you. A really great holiday home. I use the word home as that is how it felt especially after staying two weeks. Everything you need there, especially in the kitchen. Sue and Kieron have put so much thought into this house to make your holiday as comfortable as possible. If going to holiday in this area again would not hesitate to see if this property was vacant first. The views to both front and back are special if you are a city dweller- sea and moors. Sea from the living room which is on the first floor. The position allows sun in the house at front in the morning and back in the afternoon making it bright and sunny. Quite a spacious house. Private parking at front for two cars. Only a 10 minute walk into Tintagel, a lovely place to browse round. You can even see pasties being made. Lots of walks nearby with St Nectans Glen a must along with Rocky valley. Lovely beach only a 5 min drive or walk it via the coastal path with amazing views. St Michaels mount in a couple of hours if you wish to go further a field. All in all a great place in a great location. You will not be disappointed if you stay here. Thank you for writing such a lovely review about our holiday cottage. We strive to keep the property to the standards which we like to find accommodation in ourselves when we travel. Thank you also for being such wonderful guests and leaving the property so tidy and clean. It makes our Saturdays/changeover days so much easier when our guests leave the property so nicely. Although, our cleaning routine is the same however the property is left, it still makes it more of a pleasure when guests leave it as clean as you did and makes the letting so much easier. Thank you again and we hope to welcome you back to Chylowen in the future. Well situated, cosy and homely, had everything we needed. Very comfortable, great views, 10 minute walk into Tintagel. Well equipped, good communications with owner. Wonderful cottage fabulous views to moor at front and sea and farmland at rear.very well equipped tastefully decorated and wonderful comfy lounge looking out to sea.The extra television in dining room was great and very thoughtful.The eggs and wine on arrival was very nice.We will visit again definitely and would thoroughly recommend it to anyone.handy for Boscastle Port Isaac Bude Padstow Newqyay.Fabulous. We've had a great week in this comfortable, clean and well-equipped house. Welcome gift of wine and fresh eggs was a lovely touch. The surroundings are also very nice. The village with local shops and pubs is a 10-minute walk away and the coast with great views not much farther. The house served us well as a base in our exploration of Cornwall. Diana G.Where do you live? What a delightful place to spend a holiday. The house is spacious, modern, spotlessly clean and equipped with everything you need- and then some! Sue gave us a great welcome and it was comforting to know she lives close by if we had any questions. We loved being able to walk out to the cliffs or into the village from the house, and the coastal scenery is spectacular. Trebarwith is our favourite beach in the world! The sandy beach at Trebarwith Strand is just a 15 minute walk via the coast path. For the more energetic, the beautiful Bossiney beach is about a 30 minute walk away but it is well worth the walk down ! Polzeath, Daymer Bay, Rock, Widemouth Bay and Bude are all within a pleasant and scenic 30 minute driving distance. Two small supermarkets in the village of Tintagel, an easy 5-10 minute walk away, along with butcher, chemist, plentiful pubs and restaurants and tourist shops. Changeover Day: Change over day from Easter to October half-term is Saturday but can be flexible outside of these times. Short breaks available on request.